Sweet-smelling mist from boiling sugarcane juice seeps into dark, fudgy pyramids of cane jaggery. When a scraping of this is spread on hot chapatis, it makes for compulsive eating. Now consider rich, syrupy nolen gur spilling out like lava from a quintessentially Bengali dessert. “Gur is the vertex of health, heritage and taste,” says food writer Vikram Doctor in the Real Food Podcast, a show curated by him on stories of Indian food—from the everyday to the extraordinary. Doctor takes us on a sensory trip to ancestral kitchens, exotic vegetable farms and gourmet restaurants. We hear from modern agriculturalists, health practitioners and heirloom aficionados about India’s gourmet secrets. Like Doctor, other podcasters too are breaking into the new talk-radio scene in India. These episodic series of digital audio files made available on the internet are now being touted as “the new radio of the millennial era”. Talk-radio shows, built on the do-it-yourself model, are recorded in professional studios or at home using basic mobile applications. Podcasters believe it will trump traditional radio in the not-so-distant future, just as it did in the West. Unlike traditional radio, which passes off as background score for many passive listeners, talk-radio draws the consumer in. “Podcasts are a more active med­ium. They offer insights and opinions across genres,” says Ankit Dhadda, a marketing and product head at BloombergQuint in Mumbai. Dhadda notes that the mainstream media has caught on to talk-radio’s potential and is increasingly tapping it. “It’s important to disseminate inf­ormation through the most relevant platforms. Podcasts are informative and easy to access on mobiles,” he says. When Bloomberg-Quint started All You Need to Know podcast in 2016, it had less than 100 people tuning in per day. Now, it has close to 1.7 lakh listens a month. Dhadda says there are no available statistics on the podcast market vis-à-vis radio, but the media’s interest indicates its latent potential. So increasingly, individual players and mainstream media are trying to find ways to monetise content on their podcasts. Till now, most podcasters have relied on advertisers and sponsors to help monetise their shows. But they are hoping paid subscription will take off soon. Amar ­Deshpande of Baalgatha monetised content by partnering with audio publishers, syndication deals, etc. 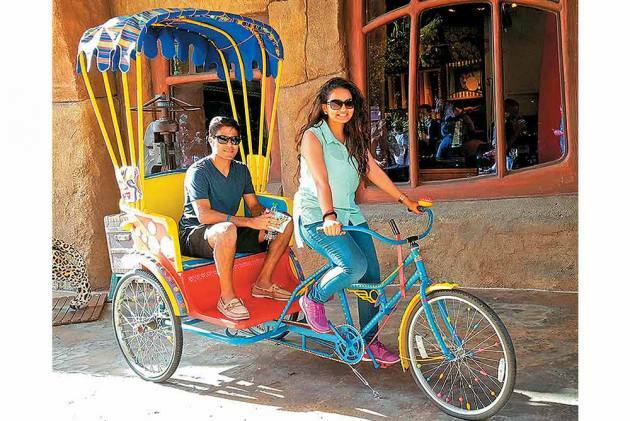 Omar and his wife Faiza—both tech enthusiasts from Bangalore—scoured the travel blogging ecosystem before launching Musafir Stories early in 2017. “We started this as a passion project to make people aware of what India has to offer through conversations with travel evangelists,” says Omar, who operates through a minimal set-up, using his own storeroom to record interviews. With over 3,00,000 listens for their fortnightly shows, Omar believes more people will tune in as awareness increases. “We want to help creators envision and produce quality content. We also want to be more creative in our ways of reaching out to people,” he says. In 2016, riding the podcast wave in Bangalore, chartered accountant Naga Subramanya started The Passion People Podcast, where he has candid conversations every fortnight with wayfaring yogis, doodlers, thespians, coffee roasters and wanderers who’ve given a meaningful direction to their passions. “In India, we are rarely encouraged to take risks or follow our passions,” he says. “I thought a podcasting platform would help me reach out to people who’ve gone against the grain.” In dishing out an immersive audio experience, Subramanya wants people to make their “calling” financially viable. “Soon, I also want to start passion events where conversations would pivot on making a success of unconventional ideas,” he adds. “To me, this was an opportunity to bypass traditional radio and create a new media category,” says Amit Doshi, founder of IVM Podcasts in Mumbai. “Even if audiences are smaller compared to television or radio, ad revenues could be higher on a rating basis.” Doshi, who started IVM early in 2015, says licences are expensive as the industry is in its startup stage and advertisers have to be courted. “But advertisers are also seeing the value of richer conversations and sophisticated messaging. Once value is built, we can monetise gradually,” he says. Even though IVM has collaborated with over 50 podcasters to garner 10 million listens so far, Doshi thinks quality control is critical for curated platforms. While podcast networks such as IVM, Audioboom, Audiomatic and Saavn have their eye on the market, podcasters are all for new ideas. Counselling psychologist Paras Sharma co-fou­nded The Alternative Story last April to make therapy more accessible. “We have experts talking about mental health concerns that are stigmatised. Our approach is non-blaming and non-disruptive, which makes it relatable to our listeners,” he says. Sharma believes access to quality mental healthcare is a privilege in India, so technology could aid in bridging the gap. “Our aim is to communicate self-care strategies in different languages for a more grounded socio-political perspective on mental health,” he says. The need to start a dialogue on vital social iss­ues also spurred Radhika Viswanathan and Samyuktha Varma to launch the Inthefield podcast in late 2017. Armed with experience in advocacy and communications, they wanted to demystify the development sector. “Most people are used to receiving information about ­social issues through press releases, newspaper articles or annual reports. These formats tend to be formulaic, and rarely tell you how complex things are,” says Samyuktha. “We wanted to feature the water cooler conversations that are rarely brought out into the open.” Inthefield has garnered close to 1,00,000 listeners not just in India and other parts of South Asia, the US, the UK and Africa, opening up space for more nuanced storytelling. Podcasts focused on political content are in their nascent stage. But Delhi-based writer Advaita Kala started The Democrat early this year to recharge what she thought to be a flagging public discourse space. “It’s important to inform the youth about real-world issues without always stoking outrage. That’s the goal of my podcast,” she says. With its “back to the roots” message, Desh­pande wants to narrate children’s stories in multiple Indian languages the same way bedtime stories used to be told. But while content is key, not all shows have to be serious. In Wordy Wordpecker, Mumbai-based journalist Rachel Lopez takes listeners on a trip into the world of stilettos, avocado, pomegranate, biscuit and gossip—showcasing the history of words. “Some people want information packed into smaller time capsules. Easy listening and trivia can garner more fans,” she says.